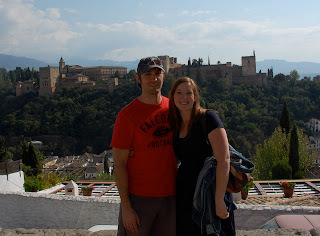 Easily the most anticipated city on our trip was Granada. 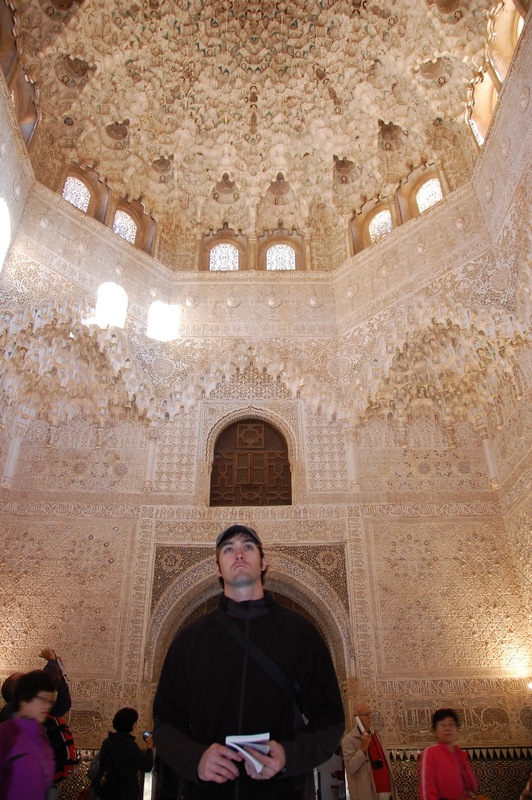 Another Moorish-influenced town in Andalucia, Granada, is home to the last Moorish fortress/palace standing before the Spanish reclaimed the region as its own - La Alhambra!! It's a crazy-busy hotspot year-round and unfortunately we didn't think to reserve tickets ahead of time. Marisa had to call the ticket office a few times, dusting off the ol' Spanish language skills to try to book an entrance time over the phone. Even more unfortunately, her phone lost the connection while she was giving the guy our card number, so we had to go for "Plan B" - waking up around 4:30am to drive the two hours to Granada to stand in line at 7:00am for the "first come-first served" tickets released each day. I'm telling you, even on a Thursday during October there were still hundreds of people in line to make sure that they go into this thing - it kind of reminded me of our visit to Versailles this summer. Loco!! 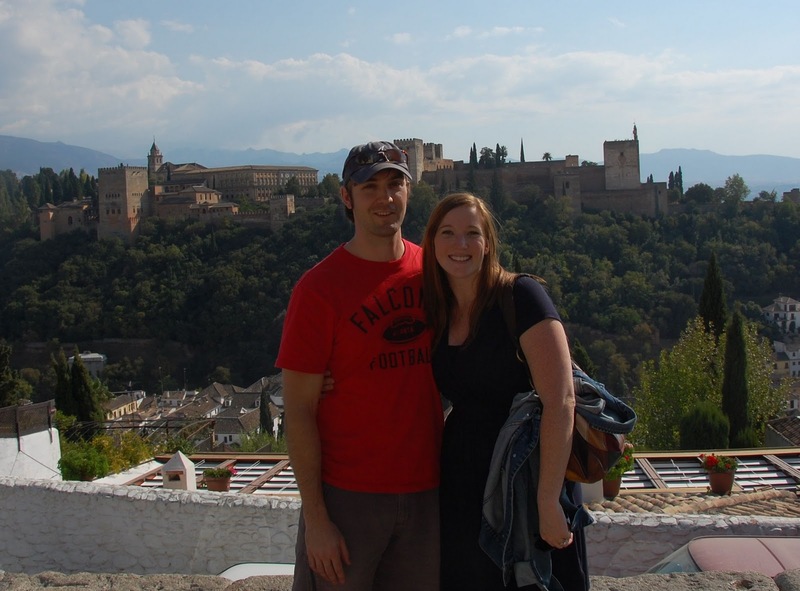 The pictures from La Alhambra are below and speak for themselves, but it was a really cool pad. We also came across a legit, local tapas bar for lunch, which was a trip highlight and we meandered through a Moorish neighborhood to a spectacular view of La Alhambra in its entirety. After standing in line in the cold morning air for at least an hour, we finally got our tickets for La Alhambra!! Marisa is in a fantastic mood as she waits for our entry time into the palace. One thing I noticed in Spain was the tremendous amount of stray cats running around. Not sure if they're down with the "spay and neuter" policy. However, some of them were cute from a distance and I couldn't help but picture them talking to me in an Antonio Banderas voice and walking around on two legs. 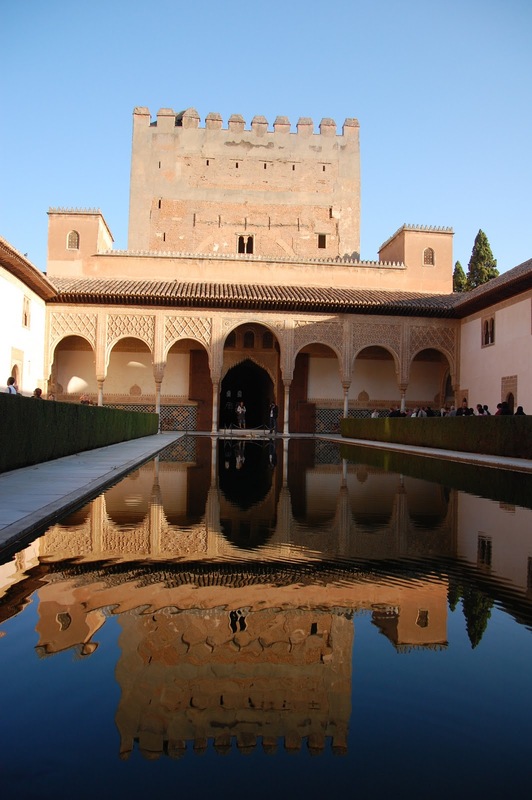 Those Moors love them some reflecting pools and I must say that I do as well. I mean, if the Lincoln Memorial can have one then why not a private one in your palace? ......and quotes in Arabic from the Qur'an - neither of which tempts you to follow idols..........unless you're a Geometry teacher or something like that. Very pretty lettering carved into plaster along the interior of many of the rooms. This close-up shows one of the most commonly occurring words - the one that looks like a "W" with a nose on the left side which means "Allah". It was supposedly in this very room on this very floor that Columbus came and spoke with Ferdinand and Isabel about his proposed voyage. I can imagine him with the flip charts going over his projected annual increases in the number of Spanish-speaking Catholics in the world. Anybody a fan of M.C. Escher? 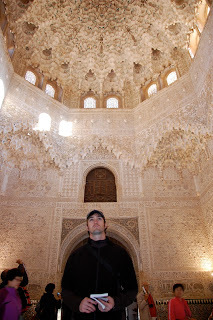 He visited La Alhambra and was inspired by the maze of geometric shapes and went on to come up with oodles of cool sketches of patterns and endless staircases and waterfalls that never reach the bottom. Marisa is checking out the palace of Charles V, which was built within the fortress in 1527 during his reign as the Holy Roman Emperor. 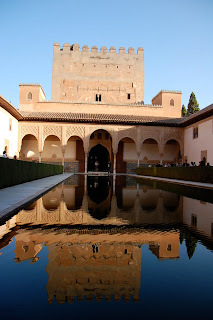 La Alhambra - reconquered from the Moors in 1492. Another famous guest was Washington Irving who spent a year here in 1829 and penned "Tales of the Alhambra". He's also the guy who gave us "The Legend of Sleepy Hollow" and "Rip Van Winkle". Tapas bar - complete with shanks of Iberian ham hanging around with little juice cups inserted so as not to drip on the bar. It was organized chaos as tons of locals came in, stood at the bar, drank a beer, killed some tapas and threw their napkins on the floor - somewhat like dropping your plastic cups in a stadium or throwing peanut shells on the ground at Roadhouse. Here we have (clockwise from top left): house specialty stuffed eggplant w/asparagus, Spanish tortilla which is like a quiche made from egg and potato, and sliced iberian ham (from the legs hanging on the ceiling). It tasted as good as it looks, and the best part about it is that when you order a drink...........they give you a free portion of paella (yellow rice cooked w/peppers and sausage or seafood). Old Moorish-style market. Today filled with tons of cheap touristy stuff - not quite like walking through markets with burlap sacks full of spices and whatnot. After taking a power-nap on some benches we mustered up the strength to hike up this hill opposite the Alhambra and were rewarded with this fantastic view. 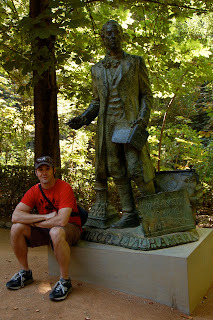 If you're going to Andalucia you cannot leave out Granada. It was a fabulous city with lots of interesting sites. On an unrelated note, this marks the 200th blog post of "Rockin' it Out" since our beginning in August of 2009. We're thankful for all that indulge in our travel pics and random cooking bits that Marisa throws out there because without an audience..............well I suppose it'd just be a journal. So "thanks" for reading.